You’ve seen this basic plot before. It’s “The Picture of Dorian Gray,” “The Curious Case of Benjamin Button,” maybe even “Winter’s Tale.” It’s the kind of picture the studios release around Valentine’s Day, a soft romance about two people who belong together but are kept apart by a secret that needs to be revealed and resolved. And yet, somehow, this movie works. It has its moments that touch our hearts and send chills up our spine. It manages to build suspense, to provide a sense of wonder, to deliver a bit of magic. The credit belongs to the talent of Blake Lively and Harrison Ford who create characters that can’t unburden themselves of the past. She finds the right balance between perky and pensive; he finds a depth that he hasn’t shown in a long time. They each find ways to set themselves – and each other — free. This is a story that gets more intriguing and more engaging as the actors and the director (Krieger) find their rhythm — and the screenwriters (Paskowitz, Burnett, Goodloe) find the voices of those they’re writing for. The beginning is slow, meandering, pretty to watch with its vintage San Francisco flashbacks, but feels like every scene is just a bit too long. The heavy voice over narration – which makes everything so explicit — makes us wonder if this wouldn’t work as well as a radio program. 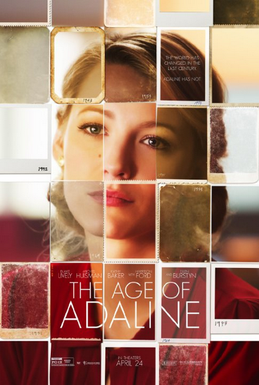 But as Adaline lets Ellis into her life, the pace picks up, the dialog improves, and the actors play off each other with a sense of chemistry and energy that makes this less a story of woman who can’t age and more of a story of a woman who won’t love. This is not a great movie — thin romances seldom are – and this one goes on for about a scene too long; we don’t need the narrator to return to tell us what we already know. But it’s not based on a book by Nicholas Sparks – and that may be reason enough to see it.